"How long does your beard cover up last? Could you go into the beard part more? I have a sparse beard but it is dark in color so it shows up fast. Maybe I'm just not very good at covering it up yet. I also get a lot of bumps and irritation on my neck from shaving so close." 1 - How long does your beard cover up last? My beard cover up lasts til about midday. At that point I can see a few whiskers showing through here and there, mostly around my chin. My wife says that maybe around early evening she can maybe sometimes see a few whiskers. At first she said it lasted all day and then I pushed her for some sort of answer. 2 - Could you go into the beard part more? I have a sparse beard but it is dark in color so it shows up fast. I am lucky in that my beard is quickly going grey, and grey is easy to cover up. And as well, my beard has a variety of colors in it with only a few of them being black. But I am very lucky in that when I shave closely I have no beard shadow at all. What do I use for my foundation? Currently I am in love with my Urban Decay foundation. It looks very natural and light. Which I love. Before that I used Clinique. I liked that at the time. For both products I went and had a makeover done. Which is the only way I would really recommend getting a good covering foundation. Just be honest with them and tell them what you want. They want you to buy their products and all of them I have interacted with have been of the utmost in professionalism. And yes I have gone in for foundation dressed as a girl and dressed as a boy and have never had a hint of weirdness from any of the sales associates. Best way ever!! I seriously recommend this, even if you have a tough beard shadow to cover up. Many of the makeover artists look at working with a guy, or a tough to cover situation as a bit of a fun challenge! One thing I have heard of for good beard coverage is Dermablend. I have never tried this product but I have heard it mentioned by many other cross dressers. It is apparently excellent in covering up any sort of beard shadow. When I checked out their website they also offer products for being able to cover tattoos. 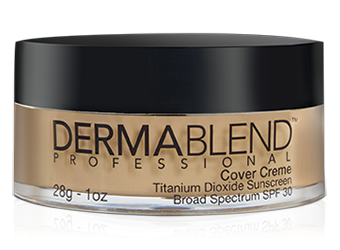 So Dermablend sort of specializes in covering things up. My concern with anytime I have tried hard to cover up my beard with a makeup product is that when you use any product thick enough to cover a beard, then it is going to look pretty caked on. I am at a point in my life where I am developing wrinkles and thick covering makeup will initially cover those wrinkles, but as soon as I do something like say smile, Then my smile wrinkles look bigger than they normally are. So these super covering foundations are great for pictures, but not so good for living life and wearing a product from dawn to after dusk. 3. Red bumps and irritated skin. I tend to personally irritation on my most sensitive skin, which happens to be my necks and my inner thighs. Honestly I have not found good solutions for this. I use some exfoliating scrubs that help. Also good shaving techniques help, like something good to shave with, shaving with the hair, never more than once in 24 hours. But my methods are not 100% perfect so if anyone reading this has good suggestions for this then please comment. 1 - get as close a shave as you can. I shave my face in the shower, first going with the grain and then a second time against the grain, carefully! Then I use an electric razor about a half an hour after I get out of the shower. This combo makes my face smooth to the touch. And if I am going to be out all day, I will never, ever shave my face twice in one day. I can do what I do once a day, day after day. 2 - Get a good quality foundation from a quality cosmetics company, that you acquire by going and seeing the people who work at makeup counters. Trust me they want to sell you their products regardless of if you are dressed as a boy, girl, or in between. I would suggest having some decorum in your dressing if you want to be taken seriously and treated politely though. 3 - Don't worry if your coverage does not last all day. If some show through, take a deep breath, and understand that it will be okay. Have you ever looked at lots of different women's faces closely? My wife did as a Clinique sales associate for a few years. She has personal knowledge of how many women have whiskers. So you are not alone! It happens to all of us! Love your beard, though it is okay to hide it, just don't hate on yourself! If you do really hate it, get it removed, life is too short to go on hating yourself. Hi, a tip i read and use is that you can use red lipstick over the shadow areas before applying your foundation. It acts as a colour corrector for those of us with dark hair. Hi Bobbie, thanks for the tip! I have heard about red toned makeup being able to counteract the blue of the beard. Thanks for reminding me about that! This looks really funny. Thanks for sharing these tips of shaving. Outfit for 6-14-14 - Belt or No Belt?